During the last 10 years, I've read many books on consumer research and better understanding the consumer's mind. From Freud to Jung, from MacLean to Levy to Zaltman and others, I've read them all. And even after all that, "Doing Anthropology" is the best book I've read on the topic of consumer research. Authors Sunderland and Denny describe their vivid experiences in the so-called field of Ethnographic Research, a trend that has been gaining popularity in the USA where only "facts," "figures" and "statistical validation" have been the norm. While the mantra in the quantitative research world is "if something exists, it must be measurable" the world that Sunderland and Denny reflect in their book says "if something exists, it must have a meaning." This book will be very useful for those serious about consumer research. It goes through what ethnography is to the invaluable (and most of the time unseen) world of cultural analysis. If you are tired of getting the same outcome in your consumer research, "Doing Anthropology" will broaden your scope. The reader will discover a new way of perceiving reality, where the act of consumption is far more than an economic transaction but a symbolic one, where the meaning of things is more important than the things themselves. 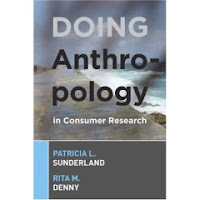 "Doing Anthropology" is also a generous act where the authors give us their secrets and share their fears and hopes as they are lived in the exciting world of consumer research. For academically oriented readers, the book is full of notes and sources, making it a great compilation of useful information. PeccataMinuta: I only wish that the many pictures of the book were in full color. After all, color is a meaning itself, an element that would make Sunderland and Denny's argument more vivid. Thomas Clayre said: "Indeed, it is well said, in every action there is inexhaustible meaning," and this book will give you a pair of glasses to discover that your brand values less from what it is than from what it means.